Gwion Edwards (right) faces former club Swansea. Peterborough United entertain Premier League opposition Swansea City tonight (August 23) and Grant McCann is promising to ‘give them a game’. Both sides go into the match on the back of Saturday defeats and the managers are keeping their team selections close to their chest. McCann said: “We don’t know whether their manager will choose to make changes to his starting line-up after Saturday’s defeat by Hull but whatever side they put out, we will give them a game. “I hate losing football matches. I am the worst in the world. I don’t think I talked to my wife on Sunday. “However, that defeat is gone, it is in the past and we are looking forward to what lies ahead. The Posh boss is without the suspended Jack Baldwin following his dismissal in the final moments of the defeat to Oxford at the Kassam Stadium. Ryan Tafazolli is still unavailable due to a hamstring injury, but McCann has not named his starting line-up as yet. He added: “We have a few bumps and bruises in the camp and obviously Jack is suspended so I have yet to tell the players the starting line-up. It will keep everyone on their toes I am sure. Ryan has been doing a lot of work with the physio, in fact a few of the other players have commented it is like he is undertaking a triathlon, but that is what happens when you are working your way back to fitness. 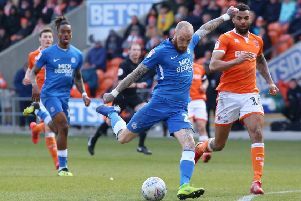 Brad Inman and Lee Angol remain long-term absentees but McCann did confirm that skipper Chris Forrester has recovered from a back injury that was troubling him ahead of the Oxford fixture. “Chris was struggling on Thursday and Friday and to be fair, felt it a bit in the warm-up, but it actually eased as the game progressed. I took him off because he had been cautioned and to be honest, I was thinking of doing the same with Jack and probably should have done. Chris is fine now though,” McCann added. Midfielder Gwion Edwards will be coming up against his former club and although the personnel has changed somewhat, it is still a tie that excites him. “I came through the youth system at Swansea and there are a few people still at the club from my time there. I will be great to be involved against my former club and hopefully we can get the right result,” Edwards said. It will be the first meeting between the sides for six years. They last met in the same competition, which was the Carling Cup then, and Brendan Rodgers’ Swans side overcame Gary Johnson’s men 3-1 thanks to a hat-trick from Scott Sinclair. Swansea have confirmed that defender Neil Taylor will defintely be starting. It will be his first appearance since starring for Wales in the European Championships.